Ripples are spreading across the search and browser world this week and some surprising players are at the center. For the first time in quite a while, Yahoo is making news for their tech rather than their company turmoil. With the release of Axis, a new search app and add-on for both iOS and desktop browsers, Yahoo aims to make browsing the Web a more visual and convenient experience. Both press and user response have been mixed however, with no small part of that likely due to the huge security hole exposed by blogger Nik Cubrilovic. Surprisingly, the app is finding early adopters among the iOS crowd, all the more interesting given that iOS Axis is essentially a skin over top of Safari. Despite this, the skin is filled with features you won’t find on Apple’s browser, such as easy toggling between regular and image searches, and instant syncing of bookmarks and tabs between desktop, iPhone and iPad. Though the main push for Axis is visual browsing, the most powerful feature of Axis may be the near-flawless device syncing across iDevices and desktop. In all, though, the Axis experience on iOS is compelling, which is in contrast to the underwhelming desktop integration; Axis ends up being not much more than an impressive syncing tool. Regaled to a small search box on the bottom of your browser, Axis is more of an unwanted intruder with abilities that don’t provide more functionality any other host of exiting add-ons. It’s also more limited than the iOS version to boot. Axis is a worthy experiment however and, at the very least, may influence the future of search for big players like Google. Whether Axis will gain any sort of large traction is yet to be seen. 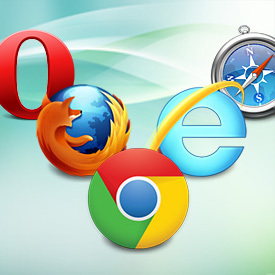 Whispers among the web rumor mill indicate another company that may try to break into the browser market however, and they already have the user issue figured out. A Friday Pocket-lint report cites a “trusted source” that Facebook wants to buy Opera Software — manufacturers of the Opera web browser, which claims more than 200 million users worldwide. The Facebook browser would include default menu bar plugins, further permeating Facebook into users’ general web experience, according to the report. There’s no telling yet if the Opera/Facebook rumors are true, but there would be no dearth of irony in seeing Facebook try to battle Google for browser dominance as Google+ struggles to play catchup in social networking. The only thing we can count on is change and innovation, and certainly some interesting skirmishes ahead.